These are the current Bravo Fleet Maps. Originally designed by JonM and later edited and updated by aio and greenfelt22. 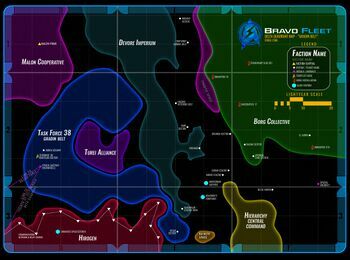 Due to upload limitations, a larger version of the Alpha/Beta Quadrant Map cannot be uploaded to the Infobase. You can find a higher resolution HERE. This page was last modified on 25 November 2018, at 19:36.